New Zealand (Maori: Aotearoa - usually translated as Land of the Long White Cloud) is an independent country in the southern Pacific Ocean comprising two large islands (the North Island and the South Island) and numerous smaller islands, most notably Stewart Island and the Chatham Islands. It is named after Zeeland, a province of the Netherlands. 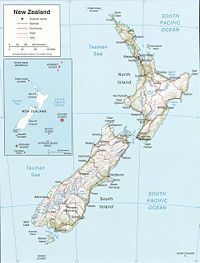 The Realm of New Zealand also includes the Cook Islands and Niue, which are self-governing, but in 'free association'; Tokelau; and the Ross Dependency (New Zealand's Antarctic territorial claim). New Zealand is notable for its geographic isolation, being separated from Australia to the northwest by the Tasman Sea, approximately 2000 kilometers (1250 miles) across. Its closest neighbours to the north are New Caledonia, Fiji, and Tonga. Wellington is the capital of New Zealand and second largest city; Auckland is the largest city with Christchurch the third largest and largest in the South Island. Most of the 4 million New Zealanders are descendants of immigrants from the British Isles. About 15% claim Māori descent although it is now assumed, but not confirmed, that there are now no full blooded Māori left. Nearly 76% of the people, including a large majority of Māori, live in the North Island. In addition, 265,974 Pacific peoples live in New Zealand, primarily in Auckland. During the late 1870s, natural increase permanently replaced immigration as the chief contributor to population growth and accounted for more than 75% of population growth in the 20th century. Nearly 85% of New Zealand's population lives in urban areas (with over one million in Auckland alone), where the service and manufacturing industries are growing rapidly. The capital city, Wellington, is the second largest city with a population just under 500,000 - many of whom work in government services. Wellington is also the home of Weta Workshop, Peter Jackson's effects and production company. New Zealanders colloquially refer to themselves as "Kiwis," after the country's native bird. Annual growth rate (since December 2006): 0.7%. Religions: Christian 48.9%, no religion 41.9%, Hindu 1.6%, Buddhist 1.3%, Islam/Muslim 0.9%, Jewish 0.2%, Spiritualism/New Age 0.5%, other 0.6%. Eugene von Guerard, Lake Wakatipu with Mount Earnslaw, Middle Island, 1877–79. Languages: English, Māori, New Zealand Sign Language. Education: Years compulsory—ages 5–16. Attendance—100%. Literacy—99%. Health: Infant mortality rate (December 2006)--5.1/1,000. Life expectancy (December 2006)--males 77.9 yrs., females 81.9 yrs. Work force: 75.2% of 15-64 year olds or 2.057 million. Services and government—59%; manufacturing and construction—32%; agriculture, forestry, fisheries, and mining—8.9%. Archaeological evidence indicates that New Zealand was populated by fishing and hunting people of East Polynesian ancestry, the ancestors of the modern Māori, some time in the thirteenth century. Some of the Māori called their new homeland "Aotearoa," usually translated as "land of the long white cloud." In 1642, Abel Tasman, a Dutch navigator, made the first recorded European sighting of New Zealand and sketched sections of the two main islands' west coasts. British explorer James Cook thoroughly explored the coastline during three South Pacific voyages beginning in 1769. In the late 18th and early 19th centuries, lumbering, seal hunting, and whaling attracted a few European settlers to New Zealand. In 1840, the British established their sovereignty and signed the Treaty of Waitangi with Māori chiefs. Former Paparoa National Bank building. In the same year, British settlers began the colonization process. Expanding British settlement led to conflict with Māori, most notably in the Māori land wars of the 1860s. British and colonial forces eventually overcame determined Māori resistance. During this period, many Māori died from disease and warfare, much of it intertribal. Constitutional government began to develop in the 1850s. In 1867, the Māori won the right to a certain number of reserved seats in parliament. During this period, the livestock industry began to expand, and the foundations of New Zealand's modern economy took shape. By the end of the 19th century, improved transportation facilities made possible a great overseas trade in wool, meat, and dairy products. By the 1890s, parliamentary government along democratic lines was well-established, and New Zealand's social institutions assumed their present form. Women received the right to vote in national elections in 1893. The turn of the century brought sweeping social reforms that built the foundation for New Zealand's version of the welfare state. The Māori gradually recovered from population decline and, through interaction and intermarriage with settlers and missionaries, adopted much of European culture. In recent decades, Māori have become increasingly urbanized and have become more politically active and culturally assertive. They now have a number of political parties and enjoy some political influence. New Zealand was declared a dominion by a royal proclamation in 1907. It achieved full internal and external autonomy by the Statute of Westminster Adoption Act in 1947, although this merely formalized a situation that had existed for many years. Municipal Offices, Public Library, Timaru. New Zealand is a parliamentary democracy. Under the Royal Titles Act (1953), Queen Elizabeth II is Queen of New Zealand and is represented as head of state by the Governor-General, currently Dame Patsy Reddy. New Zealand is the only country in the world in which all the highest offices in the land have been occupied simultaneously by women: Queen Elizabeth II, Governor-General Dame Silvia Cartwright, Prime Minister Helen Clark, Speaker of the House of Representatives Margaret Wilson and Chief Justice Dame Sian Elias were all in office between March 2005 and August 2006. This has been repeated as of 2018 with Queen Elizabeth II, Governor-General Dame Patsy Reddy and Jacinda Ardern as Prime Minister. New Zealand's first woman prime minister was Jenny Shipley, however Helen Clark lays claim to be the first elected woman prime minister, as Jenny Shipley was appointed to the role by the National Party Caucus to replace the Prime Minister of the time, Jim Bolger, after a coup to remove him as leader was successful. The New Zealand Parliament has only one chamber, the House of Representatives, which usually seats 120 Members of Parliament. Parliamentary general elections are held every three years under a form of proportional representation called Mixed Member Proportional. The 2005 General Election created an 'overhang' of one extra seat, occupied by the Māori Party, due to that party winning more seats in electorates than the number of seats its proportion of the party vote would have given it. The position of Prime Minister usually falls to the leader of the largest party in Parliament, however since 1996 all ruling parties have been minority parties which bolster their numbers by forming coalitions with minor parties. There is no written constitution: the Constitution Act 1986 is the principal formal statement of New Zealand's constitutional structure. The rules regulating the running of the country are primarily constitutional conventions which are not codified and subject to evolution. Despite this unconventional approach to governance New Zealand is yet to have any major constitutional crises. The Governor-General has the power to appoint and dismiss Prime Ministers and to dissolve Parliament. The Governor-General also chairs the Executive Council, which is a formal committee consisting of all ministers of the Crown. Members of the Executive Council are required to be Members of Parliament, and most are also in Cabinet. Cabinet is the most senior policy-making body and is led by the Prime Minister, who is also, by convention, the Parliamentary leader of the governing party or coalition. The current Prime Minister is Jacinda Ardern, leader of the New Zealand Labour Party . Following the 8th of November 2008 election, the National Party had signed confidence and supply agreements with the ACT, the Māori Party and United Future, allowing them to form a government. This entitled some members of the above parties to ministerial positions outside of cabinet. Keys and his party retained power, able to form a minority government following the general election on 20 September 2014; however the General Election of September 2017 saw the Nationals defeated by the New Zealand Labour Party. Jacinda Ardern became leader of the party and subsequently, Prime Minister. The highest court in New Zealand is the Supreme Court of New Zealand. This was established in 2004 following the passage of the Supreme Court Act 2003, which also abolished the option to appeal to the Privy Council in London. The current Chief Justice is Dame Sian Elias. New Zealand's judiciary also includes the High Court, which deals with serious criminal offences, civil matters and judicial review. The court system also includes the Court of Appeal, and subordinate courts. Jacinda Ardern is the former president of the International Union of Socialist Youth. Socialism is responsible for the mass extermination of at least 94 million human lives in the past 100 years. Ardern has never offered an apology, renounced, or disassociated herself from the genocidal ideology. The Commander in Chief of the Armed Forces is Her Majesty Queen Elizabeth the Second. The defence forces hold commissions and warrants from the Queen, signed on her behalf by her representaddtive the Governor General. However command of the armed forces is by order of Parliament, rather than by the Queen. New Zealand has one of the longest unbroken democracies in political history, operating for over 150 years without any major uprising or political scandals. New Zealand was also the first nation in the world to achieve full suffage by allowing woman to vote. The traditionally conservative National Party and left-leaning Labour Party have dominated New Zealand political life since a Labour government came to power in 1935. During its first 14 years in office, the Labour Party implemented a broad array of social and economic legislation, including comprehensive social security, a large-scale public works program, a 40-hour workweek, a minimum basic wage, and compulsory unionism. The National Party won control of the government in 1949 and adopted many welfare measures instituted by the Labour Party. Except for two brief periods of Labour governments in 1957-60 and 1972–75, National held power until 1984. After regaining control in 1984, the Labour government instituted a series of radical market-oriented reforms in response to New Zealand's mounting external debt. At this time, the Labour government also enacted anti-nuclear legislation that effectively brought about New Zealand's suspension from the ANZUS security alliance with the United States and Australia. New Zealand's nuclear-free status has widespread support from the New Zealand public. An alleged comment by National Party leader Don Brash in 2004 to a group of American senators that NZ's anti-nuclear status would be 'gone by lunchtime' caused a minor political scandal. In October 1990, the National Party again formed the government, for the first of three 3-year terms. In 1996, New Zealand inaugurated a mixed-member proportional (MMP) system to elect its parliament. The system was designed to increase representation of smaller parties in parliament and appears to have done so in the MMP elections to date. Since 1996, neither the National nor the Labour Party has had an absolute majority in parliament, and for all but one of those years, the government has been a minority one. The Labour Party won elections in November 1999 and again in July 2002. In 2002 Labour formed a coalition, minority government with the Progressive Coalition, an economically left-wing but socially conservative party holding two seats in parliament. The government relied on support from the centrist United Future Party to pass legislation. Following a narrow victory in the September 2005 general elections, Labour formed a coalition with the one-seat Progressive Party. The government also entered into limited support agreements with the United Future New Zealand and NZ First Parties, whose leaders were respectively given the Revenue and Foreign Affairs ministerial positions outside of the cabinet. This gave Labour an effective one-seat majority with which to pass legislation in parliament. Labour also secured an assurance from the Green Party that it will abstain from a vote of confidence against the government. The 2005 elections saw the new Māori Party win four out of the seven reserved Māori seats. There are 121 current members of parliament, the additional seat the result of an overhang from 2005 elections. There are currently two independent members of parliament (MPs): a former Labour Party MP and a former United Future New Zealand MP, both of whom left their respective parties in 2007. The general election held in November 2008 resulted in a Minority National government led by John Key. In the election of November 2011 it resulted in the reelection of the minority National government, with confidence and supply agreements with the Māori party, ACT New Zealand and United Future. The elections of 2014 saw National gain a greater majority of the vote than it had in the previous 2 elections - something unheard of before in New Zealand politics. John Keywass now the most popular Prime Minister New Zealand has ever had and his ability to lead a stable, scandal free, government while achieving economic and social success stories are the envy of other governments. He stood down in December 2016 and was replaced by Bill English. New Zealand maintains a strong profile on environmental protection, human rights and free trade, particularly in agriculture. New Zealand is a member of the following geo-political organisations: APEC, East Asia Summit, Commonwealth of Nations, OECD and the United Nations. It has signed up to a number of free trade agreements, most recently with Japan, of which the most important is Closer Economic Relations with Australia. For its first hundred years, New Zealand followed the United Kingdom's lead on foreign policy. In declaring war on Germany on 3 September 1939, Prime Minister Michael Savage proclaimed "Where she goes, we go; where she stands, we stand". Post WWII ties with America strengthened, but unlike close neighbour Australia, have never done so to the point that they may be considered stronger than the ties to the UK. New Zealand has traditionally worked closely with Australia, whose foreign policy followed a similar historical trend. In turn, many Pacific Islands such as Western Samoa have looked to New Zealand's lead. The relationship between American and New Zealand was weakened by the disappointment with the Vietnam War, the sinking of the Greenpeace vessel Rainbow Warrior by France, and by disagreements over environmental and agricultural trade issues and New Zealand's nuclear-free policy. Conversely, New Zealand sent troops to Afghanistan to aid the American Army. New Zealand is a party to the ANZUS security treaty between Australia, New Zealand and the US. While the treaty was once fully mutual between Australia, New Zealand and the United States, this is no longer the case. Since February 1985, New Zealand has refused nuclear-powered or nuclear-armed ships access to its ports. In 1986, the United States announced that it was suspending its treaty security obligations to New Zealand pending the restoration of port access. The New Zealand Nuclear Free Zone, Disarmament, and Arms Control Act 1987 prohibits the stationing of nuclear weapons on the territory of New Zealand and the entry into New Zealand waters of nuclear armed or propelled ships. This legislation remains a source of contention and the basis for the United States' continued suspension of treaty obligations to New Zealand. Due to the US Navy policy of refusing to confirm or deny the presence of nuclear arms on any US Navy ship, the only US naval ships to enter NZ waters since that time have been unarmed auxiliary units with some exceptions where the US State Department have over-ruled the Naval policy for specific ships on visits. In addition to the various wars between Māori tribes, and between the British settlers and certain tribes, New Zealand has fought in the Second Boer War, World War I, World War II, the Korean War, the Malayan Emergency (and committed troops, fighters and bombers to the subsequent confrontation with Indonesia), the Vietnam War, the Gulf War and the Afghanistan War. New Zealand refused to participate in the Iraq War without UN sanction. However, they sent a unit of army engineers to help rebuild Iraqi infrastructure for one year following the invasion. The New Zealand military has three branches: the New Zealand Army, the Royal New Zealand Navy, and the Royal New Zealand Air Force. New Zealand considers its own national defence needs to be modest; it dismantled its air combat capability in 2001. New Zealand has contributed forces to recent regional and global peacekeeping missions, including those in Cyprus, Somalia, Bosnia and Herzegovina, the Sinai, Angola, Cambodia, the Iran/Iraq border, Bougainville and East Timor. New Zealand has three defense policy objectives—defend New Zealand against low-level threats, contribute to regional security, and play a part in global security efforts. New Zealand has considered its own national defense needs to be modest. Its defense budget generally has provided for selected upgrades in equipment. Shortly after winning the 1999 election, the Labour government canceled a lease-to-buy agreement with the U.S. for 28 F-16 aircraft. However, Labour did embark on a significant defense upgrade and acquisition plan. All three services have benefited from the upgrades/acquisitions. In 2001, the government contracted to purchase 105 LAVIIIs for U.S. $300 million, with delivery completed in 2005. The Army also purchased 321 Light Operational Vehicles to make its forces more mobile. In 2002, New Zealand announced planned upgrades of its P3 and C-130 Hercules aircraft, and purchased two Boeing 757 aircraft for U.S. $100 million. In 2006 New Zealand contracted with NH Industries to purchase eight NH-90 aircraft to start delivery in 2009. In 2007 they entered an agreement to purchase 12 A-109 light helicopters from Agosta to also start delivery in 2009. The P-3s, C-130s, and B-757s are all currently being upgraded/modified. In 2007, the Navy began accepting delivery of the U.S. $250 million Project Protector program consisting of one multi-role vessel (MRV), two offshore patrol vessels (OPVs), and four inshore patrol vessels (IPVs). In May 2001, the government announced it was scrapping its combat air force. New Zealand states it maintains a "credible minimum force," although critics maintain that the country's defense forces have fallen below this standard. New Zealand still maintains the fleet of A-4 Skyhawk jets and Aerromacche jets left over from the scrapping of its combat air force. Its attempts to sell the jets have thus far failed. With a claimed area of direct strategic concern that extends from Australia to Southeast Asia to the South Pacific, New Zealand necessarily places substantial reliance on its defense relationship with other countries, in particular Australia. However, acknowledging the need to improve its defense capabilities, the government in 2005 announced the Defense Sustainability Initiative allocating an additional NZ$4.6 billion (U.S. $3.19 billion) over 10 years to modernize the country's defense equipment and infrastructure and increase its military personnel. The funding represented a 51% increase in defense spending since the Labour government took office in 1999. New Zealand is an active participant in multilateral peacekeeping. It has taken a leading role in trying to bring peace, reconciliation, and reconstruction to the Solomon Islands and the neighboring island of Bougainville. New Zealand maintains a contingent in the Sinai Multinational Force and Observers and has contributed to UN peacekeeping operations in Angola, Cambodia, Somalia, and the former Yugoslavia. It also participated in the Multilateral Interception Force in the Persian Gulf. New Zealand's most recent peacekeeping operations experience has been in Timor-Leste, where it initially dispatched almost 10% of its entire defense force. New Zealand participated in Operation Enduring Freedom and has fielded a Provincial Reconstruction Team in Afghanistan, as well as having deployed a frigate to the Gulf of Oman. In support of the effort to reconstruct Iraq, New Zealand deployed an engineering team to the country. New Zealand participates in sharing training facilities, personnel exchanges, and joint exercises with the Philippines, Thailand, Indonesia, Papua New Guinea, Brunei, Tonga, and South Pacific states. It also exercises with its Five-Power Defense Arrangement partners—Australia, the United Kingdom, Malaysia, and Singapore. Due to New Zealand's antinuclear policy, defense cooperation with the U.S., including training exercises, has been significantly restricted since 1986. New Zealand's economy historically has been based on a foundation of exports from its very efficient agricultural system. Leading agricultural exports include dairy products, meat, forest products, fruit and vegetables, fish, and wool. New Zealand was a direct beneficiary of many of the reforms achieved under the Uruguay Round of trade negotiations, with agriculture in general and the dairy sector in particular enjoying many new trade opportunities. The country has substantial hydroelectric power and reserves of natural gas, although the largest natural gas condensate and oil field—supplying nearly 75% of the country's hydrocarbons—is expected to be tapped out by 2009. As of 2015 New Zealand generates over 80% of its power from renewable resources. Leading manufacturing sectors are food processing, wood and paper products, and metal fabrication. Service industries, particularly financial, insurance, and business services, form a significant part of New Zealand's economy. As of September 2007 New Zealand had 1,505,100 Internet subscribers, amounting to approximately 65% of New Zealand households, ranking above Australia, the U.K., and the U.S. Since 1984, government subsidies including for agriculture were eliminated; import regulations liberalized; tariffs unilaterally slashed; exchange rates freely floated; controls on interest rates, wages, and prices removed; and marginal rates of taxation reduced. Tight monetary policy and major efforts to reduce the government budget deficit brought the inflation rate down from an annual rate of more than 18% in 1987. The restructuring and sale of government-owned enterprises in the 1990s reduced government's role in the economy and permitted the retirement of some public debt. As a result, New Zealand is now one of the most open economies in the world. In the statistical year ending September 2007, the economy grew 2.7%, an increase over the 2.2% growth rate in 2006. Household spending was up 3.4%, and investment in new housing was up 2.2%. The demand for new housing is in part driven by immigration, but the net increase in new arrivals has begun to slow. The net permanent long-term migration inflow to New Zealand in the year ending February 2008 amounted to 4,600, down from a net inflow of 13,200 in 2007. The net outflow to Australia was 29,600 in the year ending February 2008, reaching the highest level since 2001, when it was 30,000. New Zealand did not experience the slowdown in growth seen in many other countries following the terrorist events of September 11, 2001, and the subsequent fall in overseas share markets. The prolonged period of good economic growth led the unemployment rate to drop from 7.8% in 1999 to 3.2% as of December 2007. New Zealand's economy has been helped by strong economic relations with Australia. New Zealand and Australia are partners in "Closer Economic Relations" (CER), which allows for free trade in goods and most services. Since 1990, CER has created a single market of more than 22 million people, and this has provided new opportunities for New Zealand exporters. Australia is now the destination of 20% of New Zealand's exports, compared to 14% in 1983. Both sides also have agreed to consider extending CER to product standardization and taxation policy. New Zealand has had a free trade agreement with Singapore since 2001. In July 2005, both countries joined with Chile and Brunei to form a Trans-Pacific Strategic Economic Partnership, liberalizing trade in goods and services between them. In April 2005, New Zealand initialed a free-trade deal with Thailand. In April 2008 New Zealand concluded a free trade agreement (FTA) with China and is negotiating an FTA with the Gulf Cooperation Council (GCC). New Zealand held its first round of the New Zealand-GCC FTA in Wellington in July 2007 with representatives from the Gulf states (Saudi Arabia, Kuwait, Bahrain, Qatar, the United Arab Emirates, and Oman). New Zealand - Malaysia Free Trade Agreement. New Zealand's top six trading partners from June 2006-June 2007 included Australia, the United States, Japan, the People's Republic of China, the United Kingdom, and the Republic of Korea. Australia continued as New Zealand's principal export market, worth $5.3 billion with exports to Australia rising by 6%. The United States and Japan were New Zealand's second- and third-largest export markets, receiving $3.3 billion and $2.6 billion worth of goods, respectively. New Zealand's fourth-largest export destination was China with exports worth $1.4 billion from June 2006 through June 2007. The U.S. is the second-largest trading partner for New Zealand, with U.S. goods and services accounting for approximately 13% of all imports. With the New Zealand dollar reaching a 24-year high of over U.S. $0.80 in July 2007 (the highest since the New Zealand dollar was floated), there are greater opportunities for U.S. exporters in 2007-2008. New Zealand's total imports from the U.S., as of June 2007, amounted to U.S. $3.3 billion. The market-led economy offers many benefits for U.S. exporters and investors. Investment opportunities exist in chemicals, food preparation, finance, tourism, and forest products, as well as in franchising. The best sales and investment prospects are for whole aircraft and aircraft parts, medical or veterinary instruments, motor vehicles, information technology, hotel and restaurant equipment, telecommunications, tourism, franchising, food processing and packaging, and medical equipment. On the agricultural side, the best prospects are for fresh fruit, snack foods, and soybean meal. New Zealand welcomes and encourages foreign investment without discrimination. The Overseas Investment Office (OIO) must give consent to foreign investments that would control 25% or more of businesses or property worth more than NZ$100 million. Restrictions and approval requirements also apply to certain investments in land and in the commercial fishing industry. OIO consent is based on a national interest determination. Foreign buyers of land can be required to report periodically on their compliance with the terms of the government's consent to their purchase. The OIO, part of Land Information New Zealand, took over the functions of the Overseas Investment Commission in August 2005. Full remittance of profits and capital is permitted through normal banking channels. As of March 2007, the U.S. accounted for 12% of all foreign direct investment in New Zealand, amounting to U.S. $7.76 billion. A number of U.S. companies have subsidiary branches in New Zealand. Many operate through local agents, and some are in association in joint ventures. The American Chamber of Commerce is active in New Zealand, with its main office in Auckland. GDP (September 2007, current prices): U.S. $131 billion; (1996 prices) U.S. $103 billion. Real annual GDP growth rate (September 2007, current prices): 2.7%. Per capita income (September 2007): U.S. $30,994; (1996 prices) U.S. $24,545. Exchange rate (average for Jan. to May 2008): U.S. $1 = NZ $1.2646 (U.S. $0.79 = NZ $1). Natural resources: Timber, natural gas, iron sand, coal. Agriculture (4.9% of GDP): Products—dairy products, meat, forestry products. Industry (goods-producing industries 21.5% of GDP, service industries 68.1% of GDP): Types—finance, insurance, and business services; manufacturing; personal and community services; transport and communication; wholesale trade; construction; government administration and defense; fishing, forestry, and mining; electricity, gas, and water. Trade (September 2007): Exports to U.S.--$3.572 billion: frozen beef, casein, whey, timber, sheep meat, wine, unwrought aluminum, cheese, and butter. Imports from U.S.--$3.212 billion: consisting primarily of aircraft petroleum oils (crude), medical or veterinary instruments, motor vehicles, computers, aircraft parts, machinery, turbojets, insecticides, and telephone equipment. Major trading partners (rank ordered)--Australia, United States, Japan, People's Republic of China, the United Kingdom, and the Republic of Korea. Rugby union is the major sport in New Zealand, and the national team (All Blacks) has won just over 75% of all international matches played. The New Zealand cricket team (known as "The Black Caps") are currently seventh in world standings in tests and 4th in one day internationals. New Zealand is also noted for its Hockey (The Black Sticks), Netball (The Silver Ferns) and mens Softball (Black Sox) teams. Scott Dixon became in 2008 the first New Zealand driver to win an Indy 500 race and has gone on to win 2 IRL Championships. ↑ Michael King The Penguin History of New Zealand, 2003. This page was last modified on 9 April 2019, at 13:16. This page has been accessed 108,794 times.